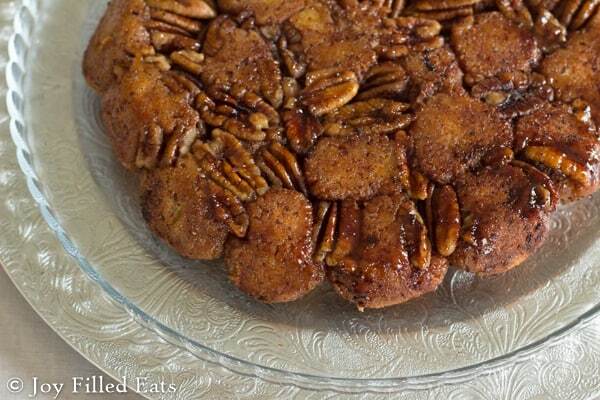 Gorilla Bread is classic monkey bread with an amazing twist. 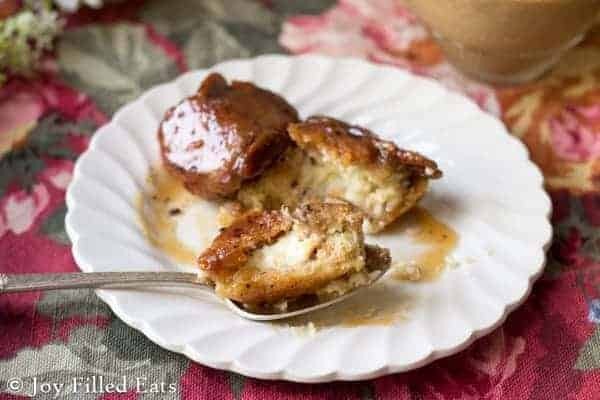 Every ball of sweet, cinnamon dough is filled with cream cheese. This is the ultimate brunch indulgence! I grew up making Cinnamon Pull Apart Bread. It’s one of the first things I remember making. 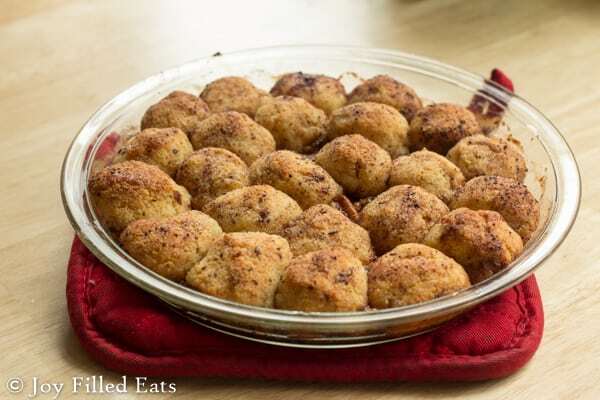 I would open a can of biscuit dough, cut each circle into four pieces, dip each in butter, roll them in cinnamon sugar, and put layers of them in a bundt pan. After I got married I became a Paula Deen fan. 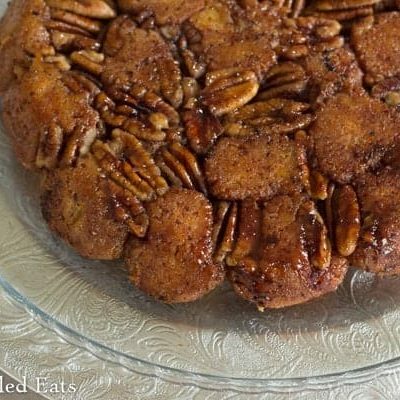 Her Gorilla Bread is basically my Cinnamon Pull Apart Bread marrying a Cheesecake. Amazing. Like every other delicious recipe, I have memories of from back in the day I just had the make this one healthier. I used the same dough from my Cinnamon Rolls and Caramel Pecan Sticky Buns but stuffed each piece with cream cheese. I was afraid the cream cheese would ooze out but it didn’t. Each piece of the gorilla bread is lightly sweetened, flavored with cinnamon, and filled with cream cheese. Move over Paula Deen. This cream cheese filled cinnamon Gorilla Bread is low carb, sugar/gluten/grain free, THM S and just as delicious as yours! This is a basic mozzarella based dough. 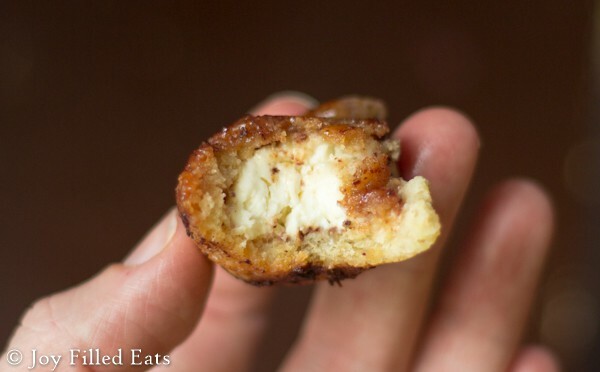 The trick to these is to have the cheese super gooey before mixing in the other ingredients. If not it can taste cheesy. The list of ingredients isn’t as long as it seems because there are a lot of repeats. You use butter and cream cheese in each part. Traditionally this is baked in a bundt pan but I was afraid my bundt pan was too big. I really want one of the 6 cup, 8 inch bundt pans to make this recipe in. So I just went ahead and baked it in a pie plate. It worked fine but I do think bundts are pretty. The caramel sauce is optional. I’ve made this with and without it. Without it is lightly sweetened like a breakfast pastry. With it, it is more like a dessert. Preheat the oven to 350. Spread 1 t butter in the bottom of a pie plate. Mix the 1/2 cup sweetener with the cinnamon. Sprinkle 1 tsp of this in the buttered pie plate. Set aside the rest. 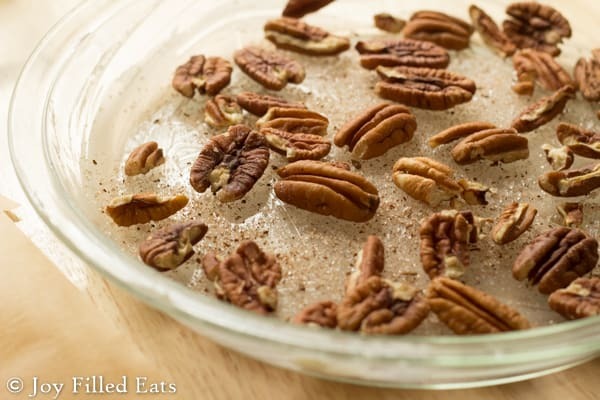 Sprinkle the pecans on top (if using). (optional) Combine the first three sauce ingredients and cook over medium low heat until bubbly, slightly thickened, and lightly browned. This will takes about 5 minutes. It will thicken further during baking. Remove from the heat and add the salt and extract. Set aside. Put the mozzarella and one ounce of cream cheese in a microwave safe bowl. Microwave one minute. Stir. Microwave 30 seconds. Stir. At this point all the cheese should be melted. Microwave 30 more seconds until uniform and gloopy (it should look like cheese fondue at this point). Add the rest of the dough ingredients and the cheese to a food processor. Mix using the dough blade until a uniform color. If you do not have a food processor you can mix in a medium bowl with a wooden spoon but you may need to dump it onto wax paper and knead it by hand to thoroughly incorporate the ingredients. Once it is a uniform color wet your hands and press it out into a 9×12 ish rectangle on a piece of parchment. 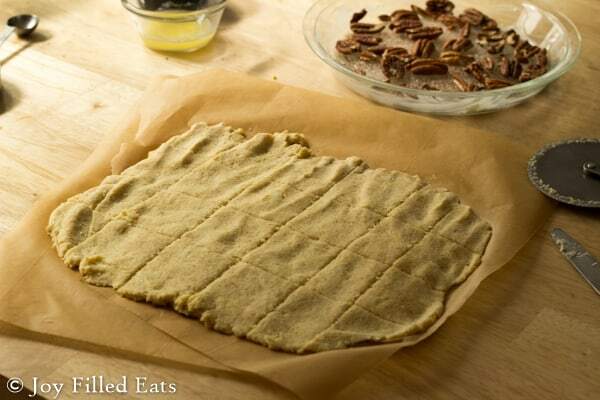 To assemble: Cut the dough into 24 pieces. Cut the cream cheese into 24 pieces. 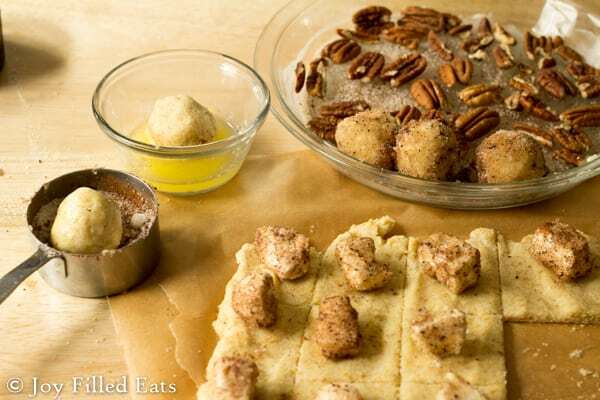 Sprinkle each piece of dough with 1/4 teaspoon of cinnamon sweetener. Place a cube of cream cheese in the center of each, wrap and seal the dough around the cream cheese. 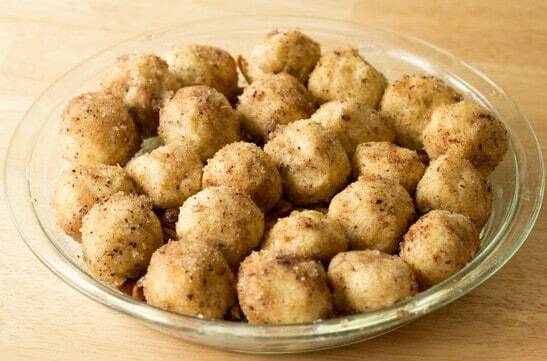 Dip the dough ball in butter. Roll it in the cinnamon sweetener. Put it in the prepared pie plate. Repeat with all 24 pieces. (If you have extra sweetener sprinkle it on top. If you run out of the sweetener before you are done just mix up a little more). Drizzle the sauce over the top, if using. Bake at 350 45-50 min until the rolls are golden brown and the sweetener is bubbling. Cool for 10 minutes. Invert onto a serving plate. Try not to eat all of them by yourself. The caramel sauce is optional. I've made this with and without it. Without it is lightly sweetened like a breakfast pastry. With it, it is more like a dessert. Leftovers are best warm. I ate this for breakfast for almost a week. I would microwave a few pieces in the microwave for 30 seconds and enjoy with my coffee. This looks so yummy. I’d like to make it for Christmas tomorrow morning. Can pre- grated/ shredded mozzarella be used for this? Also is the coconut flour necessary? I really don’t like it’s taste and texture. Yes to shredded mozz. You can omit the coconut flour, just add additional almond flour. This looks delish! 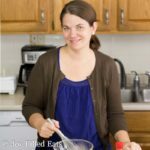 Can I sub the THM baking blend for the almond, flax, etc? Would it be equal parts? Thanks! This looks amazing. I have 2 questions: 1. I don’t use flax so how much extra Almond flour? Your recipe just says extra. 2. I don’t have a microwave. Are there instructions for melting the cheese on the stovetop? You're a keto wizard! Such a cool variation on a classic recipe and I can't wait to try it!! Thanks! Oh how fun! This would make perfect breakfast or dessert! What kind of mozzarella do you use? Just regular inexpensive mozzarella found in blocks in the dairy section like Sorrento, Polly'O, etc. I stay away from sugar and any kind of artificial/natural sweeteners. Wondering if you have tried this without the sweetener. No. You could make it a savory dish by using herbs and sea salt. I'm not sure how it would taste just eliminating the sweetener. What could you substitute for the THM baking blend or your local baking mix and THM gentle sweet sweetener? I'm on a pretty tight budget and live in the middle of nowhere so I'm trying to find things to substitute that don't cost an arm and a leg or have to travel two hours to buy. Thanks. Is this fresh mozzarella or a block? This looks amazing!!!! I tried your cinnamon waffles earlier in the week as well. I am wanting to follow you on pintrest but can't see you find the follow button. Any ideas??? Could I use Swerve sweetener in place of the blend? should this recipe have baking powder ? I made this and it didn't rise. Hi Lorena, I didn't use baking powder when I made them. Mozzarella doughs tend to be more dense and firmer than a wheat and yeast dough. Hi Debbie, the recipe is right in the post. There is a printable version too. If you are on mobile you need to click the 'read more' button to get to the recipe. If you scroll down slowly you should see it. Let me know if that doesn't work! I'm a bit confused as to how many this serves? What is considered a serving for THM? Thank you! I can't wait to try this. H Deb, I'm not an expert on serving size. I would eat two or three pieces. I had two for a snack or dessert or three for breakfast. By pieces I mean one dough ball that is stuffed with cream cheese. I am unsure of the melted cheese part, am I melting both cheese's? Hi Brenda, You melt the mozzarella and 1 oz of the cream cheese. Make sure it is really melted well. The other 7 oz of cream cheese are cut into cubes to fill the dough. Do you think that this could be made ahead and then baked later? Make in the morning and baked after supper?